Kelsey Stewart contributed to this report. Photo by Erin Duffy, Omaha World-Herald: Riverview Community Church in Ashland has become a distribution center for flood relief supplies. emergency management. As counties qualify, they will be added. 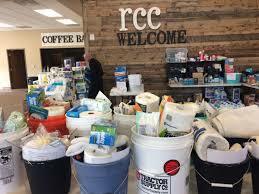 This entry was posted in Nebraska / Midwest News and tagged Nebraska Emergency Management Agency, Omaha World-Herald Report, ways to aid those impacted by flooding on March 24, 2019 by Helen Deffenbacher.